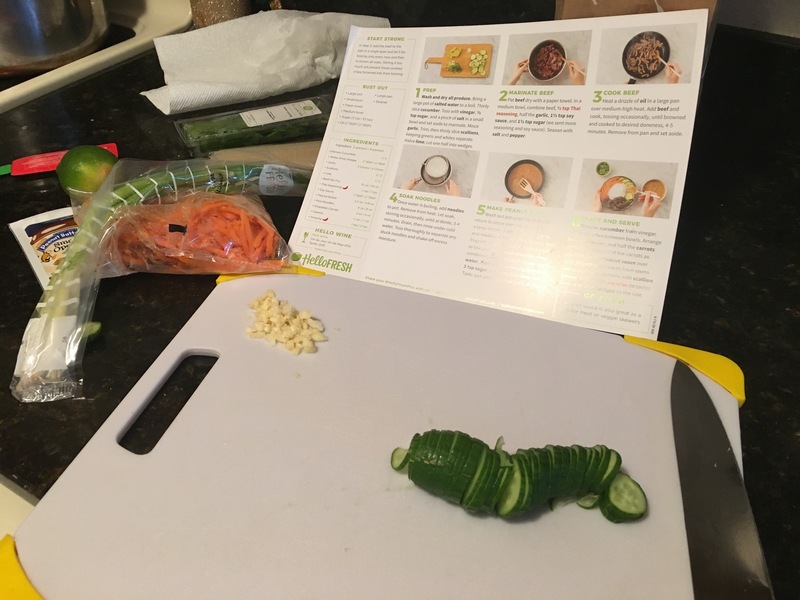 So big surprise, I finally broke down and gave Hello Fresh! a try this week. We had a coupon for $35 off our order, meaning we paid $25 for three (3) meals shipped to our door step. Not only was that a great deal, I was also hopeful that Hello Fresh! would introduce some new recipes into our rotation. Keep on reading for my recap of our experience. 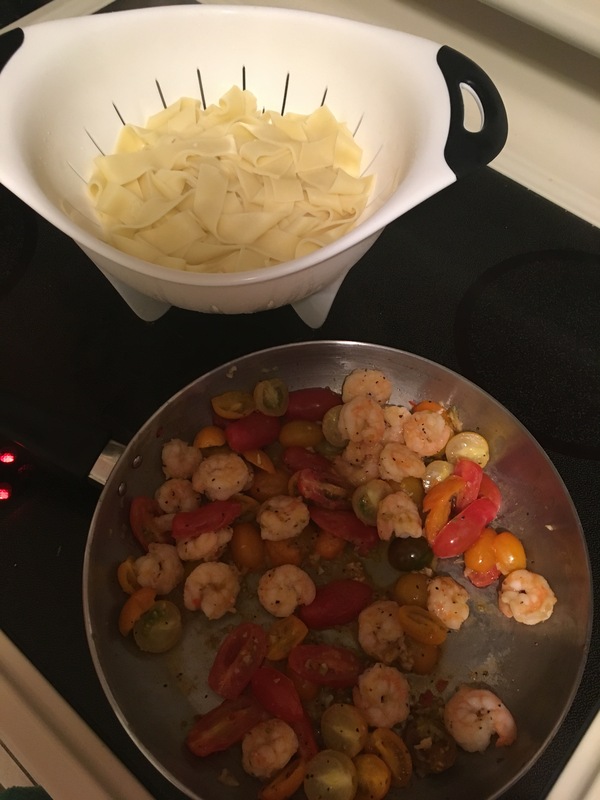 Meal #1) Shrimp: Portion was sufficient; flavor was bland; directions were clear and meal was prepared in less than 20 minutes. 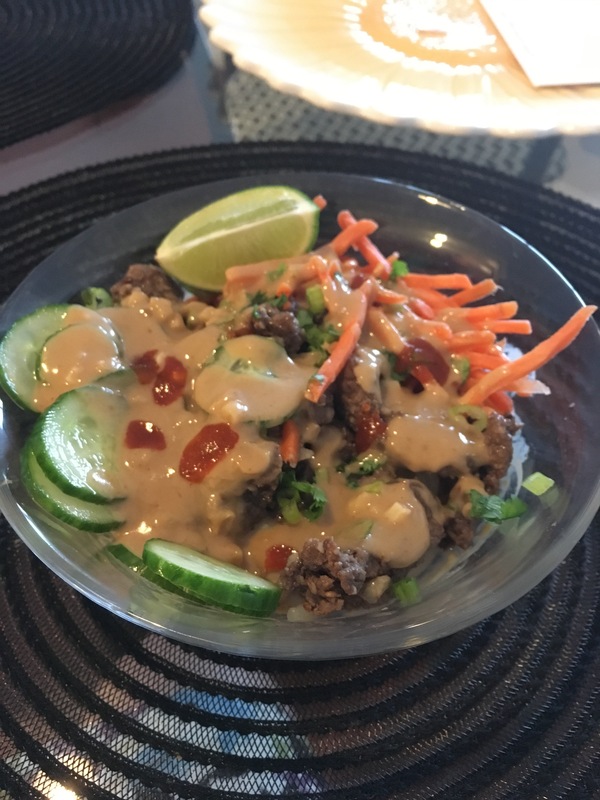 Meal #2) Thai Bowl: Portions were insufficient; flavor was great; directions were clear and meal was prepared in less than 30 minutes. So, as you can gather, each meal has its pros and cons. So the final verdict? 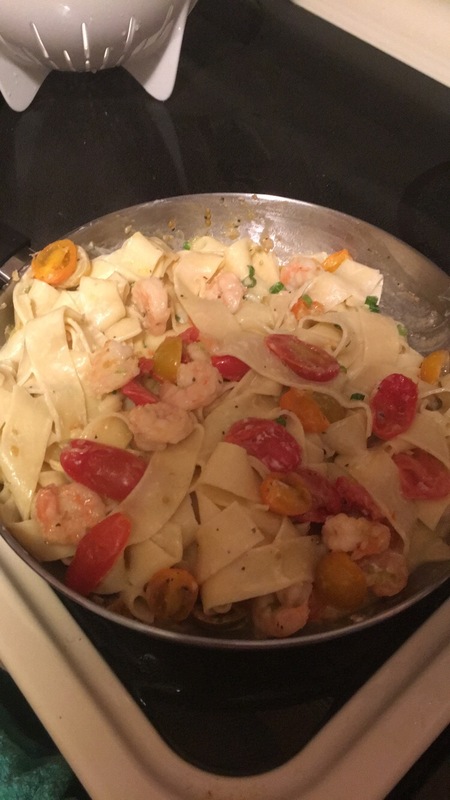 Would I buy Hello Fresh! again? 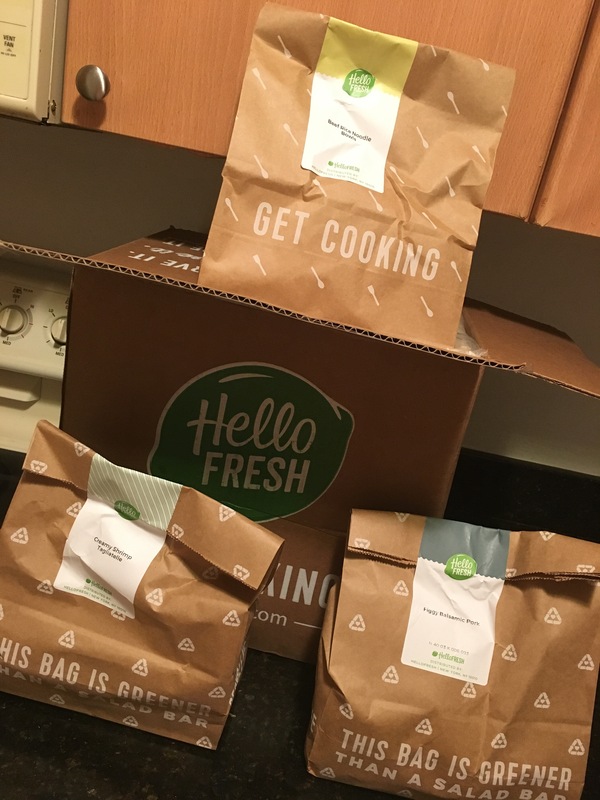 Hello Fresh! 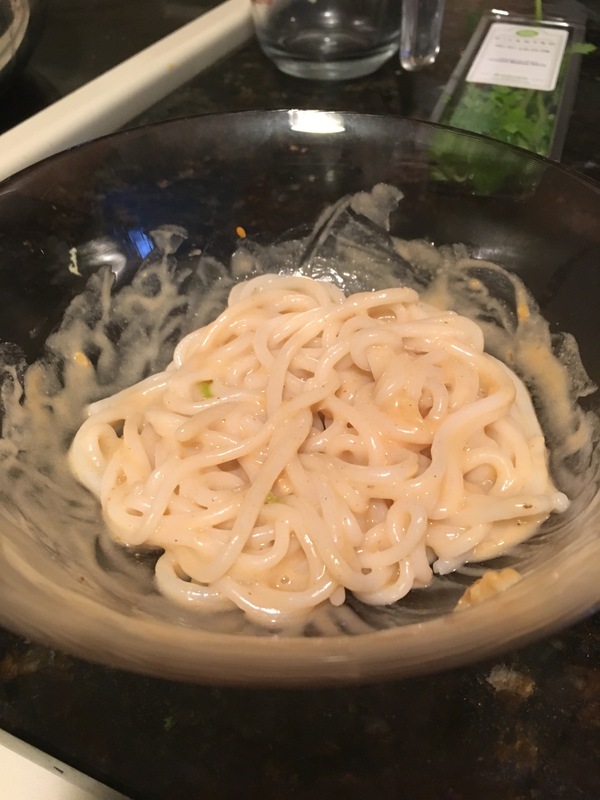 was super fun and it was enjoyable to cook something new with my boyfriend—it definitely felt like a special treat because it was something out of the ordinary. 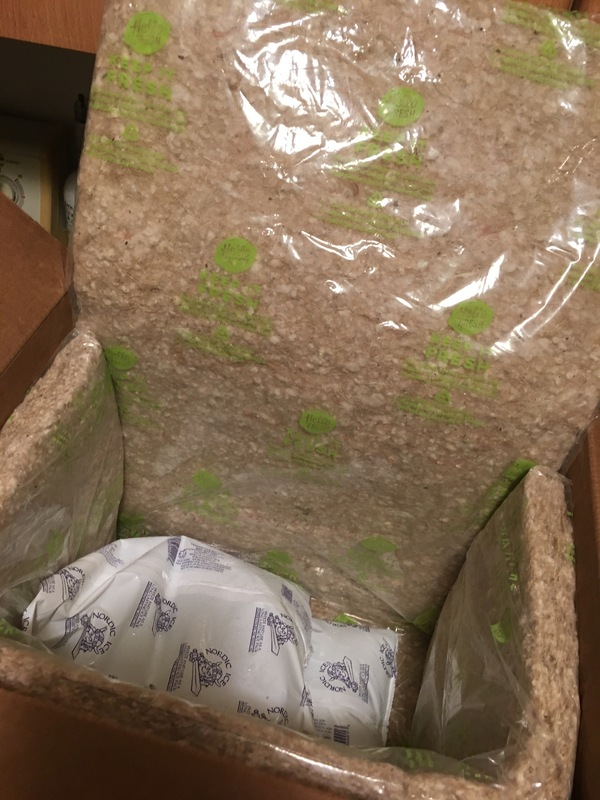 The late package really upset me, in the end I felt like the company made right of the situation, but it was difficult to get clarification and assurance from the company. 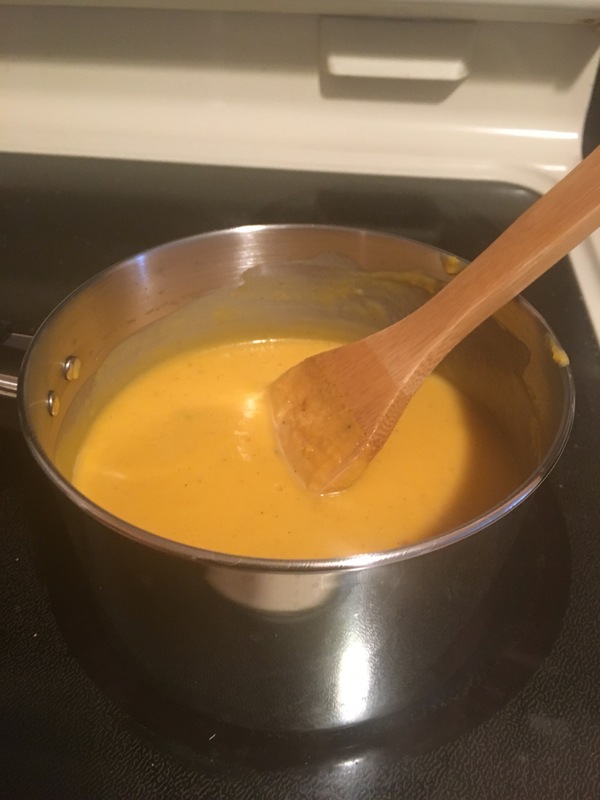 The meals are reasonably price, and I like that you have the flexibility to skip weeks and choose your meals. I don’t think we’ll be buying Hello Fresh! every week, but it’s a nice treat every once in awhile. Do you have more questions about my experience? Leave me a comment below! Everyone knows that as a nation our consumption of sugar is out of control. It’s not a secret that diets high in sugar are linked to a variety of negative health effects. Not to mention, no one is immune from the dangers of sugar and it’s sadly effect kids, adults, and our elderly population alike. I came across an article today that said the best way to cut your ‘sweet tooth’ is by doing so gradually. I thought the article suggested a great idea which is to gradually reduce ‘sweets’ but replace them with fruit so your body is still tasting the sweet, but the fruit provides your body with much more vitamins and minerals. According to this article, using artificial sweeteners doesn’t reduce your sweet tooth by any means. And the final thing I found interesting was that exercise, aside from being healthy, also helps to reduce sugar cravings. So when you work out, it’s a double win for your health! Check out the full article here. What are your tips for reducing sugar in your diet? 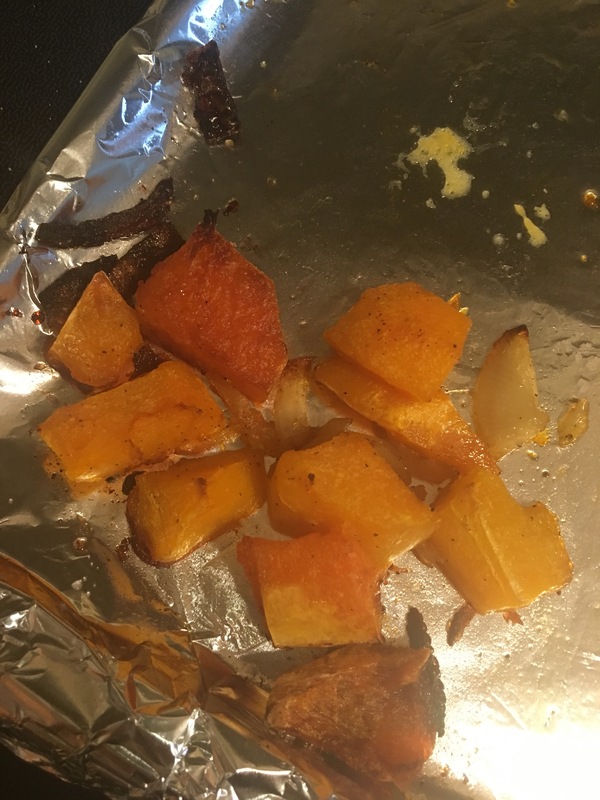 I read on twitter this morning that American’s throw away 19% of vegetables and 14% of fruits we buy at the grocery store– talk about wasted money! The Academy of Nutrition and Dietetics had something to say about that. Check out this inforgraphic below for a breakdown on how to store your produce. Are there any that you disagree with or were a surprise? I was surprised that tomatoes are best stored on the counter, I always keep mine chilled, but now I have something new to try this week. Let me know if you tried any of these suggestions and if you found them helpful? Also, has anyone tried this app? 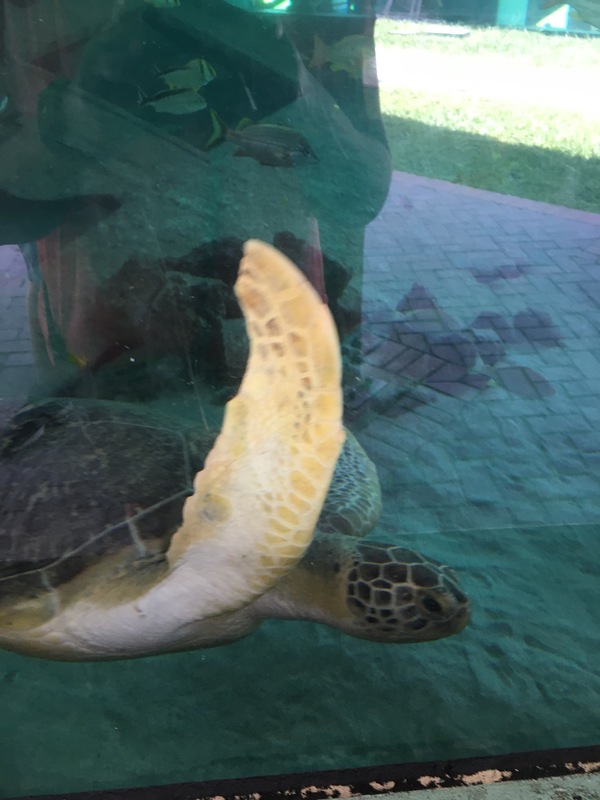 Last weekend my boyfriend and I ventured to Gumbo Limbo Nature Center in Boca Raton, Florida. 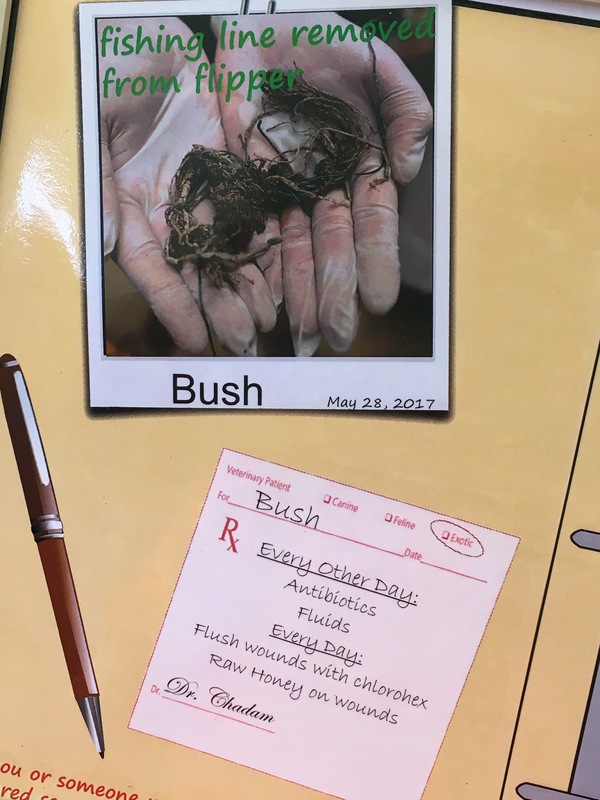 We love exploring different nature centers and walking trails so this was right up our alley. It’s a suggested admission donation of $5 per person. Once inside you have access to a Nature trail hike, a butterfly garden, and the sea turtle rehabilitation center. 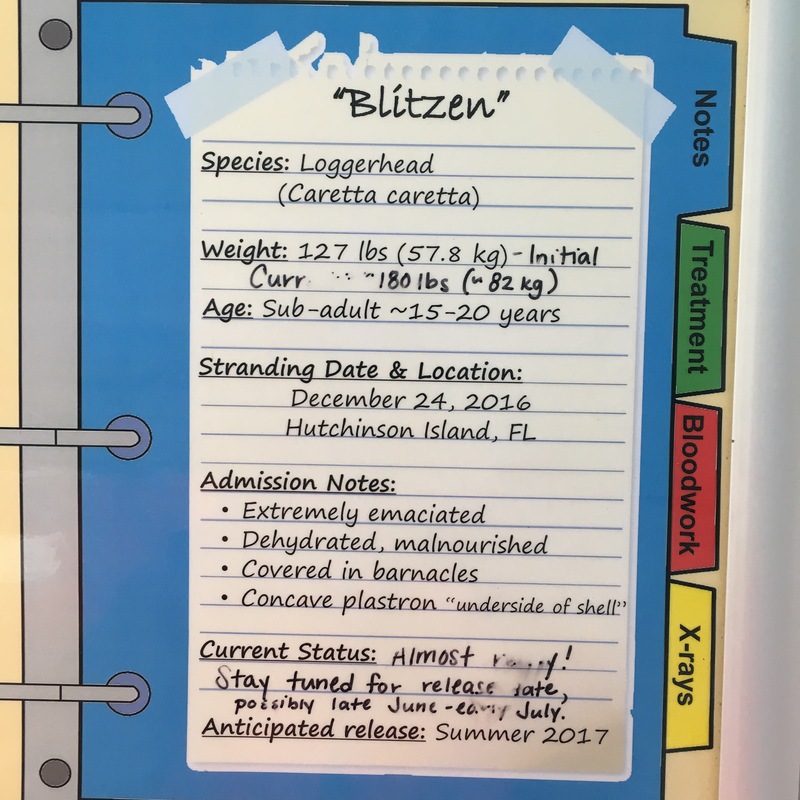 What I loved MOST about the sea turtle rehabilitation center was the description that was provided about each animal. 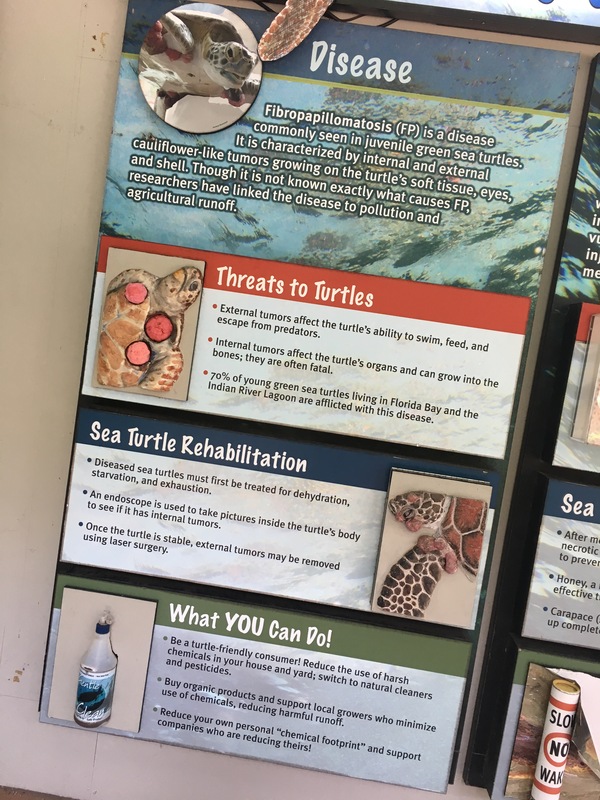 They included information about where they found the sea turtle, what its current health status is, and how they are treating and healing the creature. Look at this cute little guy with his cast. 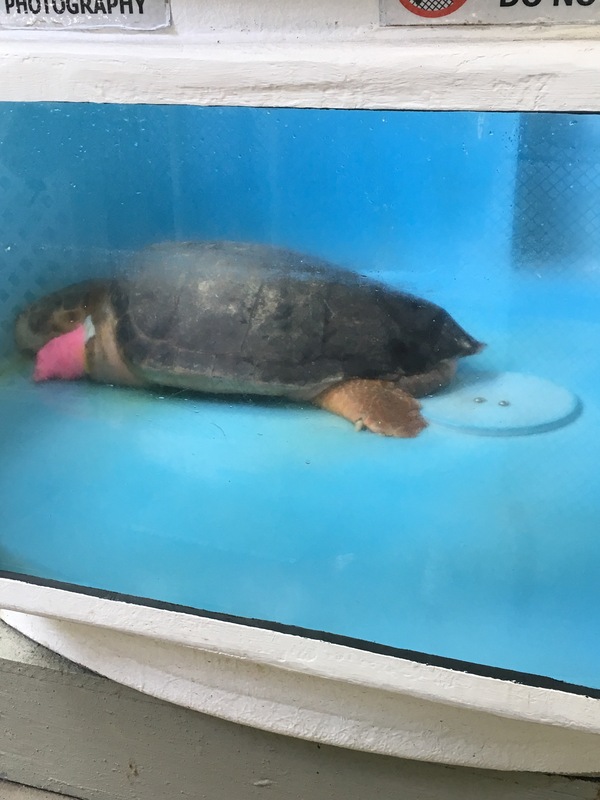 What I thought was so interesting was that 70% of turtles develope these tumors on their body, than can effect their ability to survive depending on where they form and if they form internally or externally. But in my opinion 70% is a very high percentage! 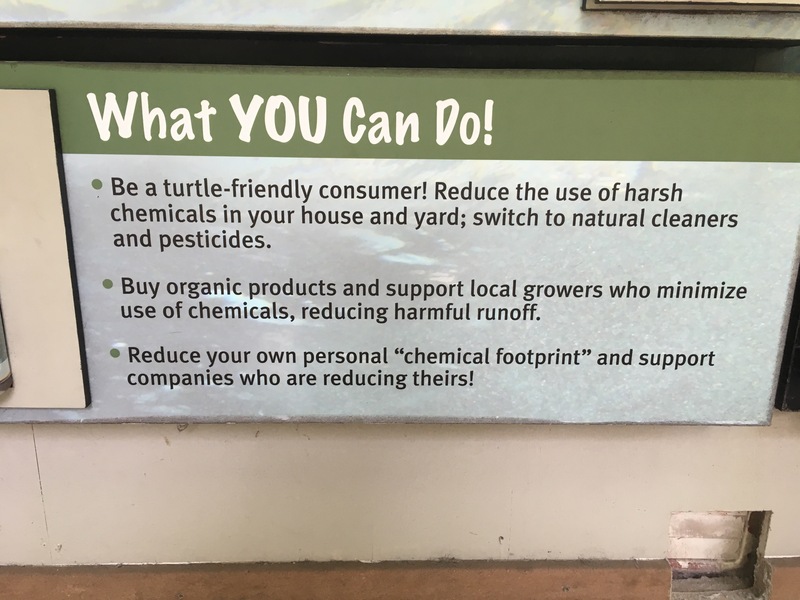 However, what I found even more interesting was that the information board said that if you want to help prevent these tumors from developing the best thing you can do is buy more organic products and less products using harsh chemicals. This was a major wake up call for me– if these chemicals are causing tumors in 70% of sea turtles, and these are the same products we are using on our skin, to clean our house, to wash our clothes, then is it any wonder why chronic disease is on the rise?!? Maybe organic is out of reach for many of us– it’s expensive, I know. But we can all make small changes to a more natural life style and we need to be aware of the effect that excess chemicals have our our planet, our environment, and our own health! Be healthy, be happy! Kale, and Chard, and Cauliflower, oh my! Last week I started my final dietetic internship rotation for Community Nutrition- and that means I officially have 6 weeks left until graduation!!!! For these next 6 weeks, I will be spending my time at Nourse Farm in Westborough, Massachusetts. During my orientation, I got a tour of Nourse Farm and was surprised to learn that even in New England there is still fresh produce growing this time of year. Pictured below is some beautiful Kale, Swiss Chard, and Cauliflower. You might be wondering what a dietetics student is doing on a farm. Well, I will be working with the Registered Dietitian on the farm to do some community outreach. Through the farm’s CSA (or community supported agriculture), we will be providing some cooking demonstrations and recipe tastings to get people eating more vegetables. The farm is also working to put out it’s own cookbook! The Registered Dietitian also provides some nutrition education to the local schools which I will have the opportunity to assist with. The thing I am most excited about for this rotation is the ability to use the Farm to Table mentality to help connect people with real food! I am thrilled to be able to end my dietetic internship at such an awesome place and highly encourage anyone in the area to consider visiting their farm store or consider the U-pick season and CSA next summer! Take time for yourself, you need it! Life is stressful, end of story. As a college student I barely have a moment to breath and that’s the truth. But whether your a mom or dad or a big time CEO or wherever you are in life, we all have our daily challenges. Everyone’s challenges are different and there’s no need to compare who is more stressed. The one thing we can all relate to is we need to take some time to ourselves. Going back to my earlier point however, when we are living busy, stressful lives it can be hard to justify taking even just 5 minutes for meditation. That’s why I really liked this idea of shower meditation. Everyone has to shower so once you get into the habit of doing this it you don’t really have an excuse to stop. I like to shower at night, so for me meditation before bed is a great way to get me to relax and have a peaceful nights sleep. If you shower in the morning, morning meditation can still be a great thing to get your day started and help you set your purpose and focus for the day. Give it a try and let me know if you like it! Have a healthy and happy weekend my friends!